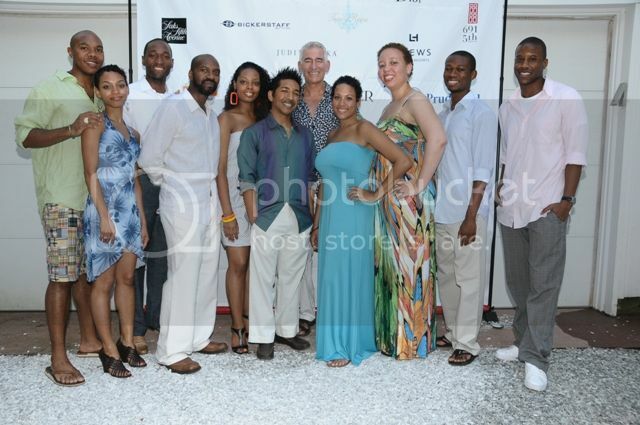 Southampton, NY Aug 22 - On Our Toes in The Hamptons, the 6th annual fundraiser for Ronald K. Brown’s world acclaimed Evidence, A Dance Company, proved to be once again one of the most electrifying cultural events of the summer season. 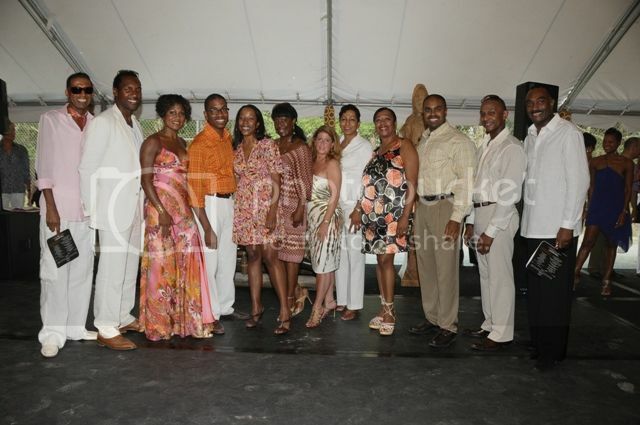 Held this year at the Watermill, NY estate of the Honorable Bernard Jackson and his wife Joyce Mullins-Jackson, vice chairman of the Evidence Board of Directors, the late afternoon fete drew over 300 luminaries from across the country including the First Lady of New York, Michelle Paterson, award winning actress, Lynn Whitfield, Christian Dior President Stephane Barraque, Uptown Magazine’s Jocelyn Taylor, National Cares Mentoring Movement Founder Susan L. Taylor, and scores more of the Hamptons and New York’s most glittering movers and shakers. 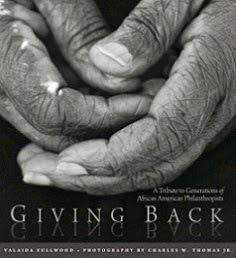 BlackGivesBack attended this event, which proved to live up to its reputation as the premier African American cultural event in the Hamptons. 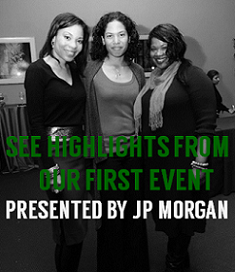 In photo: Event hosts Joyce Mullins-Jackson (who told me she's a subscriber to BlackGivesBack! 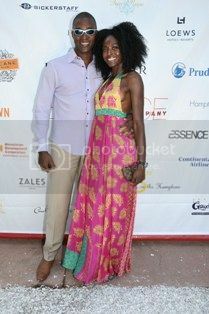 ), her husband the Honorable Bernard Jackson, and Jocelyn Taylor of Uptown Magazine. 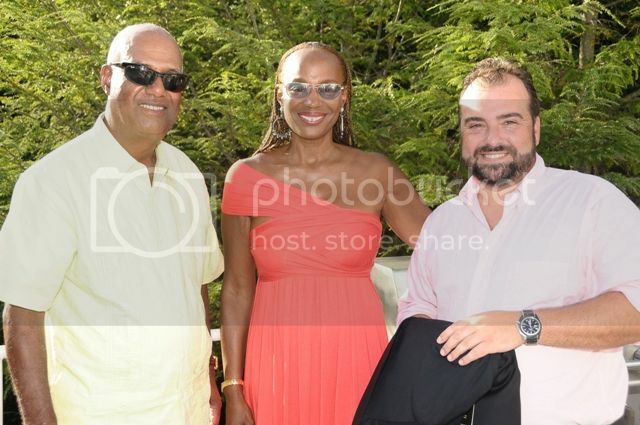 The very social Alicia Bythewood chaired the event which began with drinks poolside under bright sunny skies. Guests munched on a dazzling array of seafood appetizers from The Seafood Shop including Spicy mini crab cakes to the quintessential Hamptons treat tiny lobster rolls washing it all down with chilled Veuve Clicquot Champagne or the specially created 10 Cane Rum Toe Tapper. Ms. Bythewood led a dynamic committee that assisted her in this event including fashion designer b Michael, Gail Monroe Perry, Harriet Michel, Brian and Mira Mullins, Ronald K. Brown, Donna Williams, Reginald Van Lee, Neil R. Lowe, Joyce Mullins-Jackson, Reggie Canal, Leslie Mays, Zaid Abdul-Aleem, Dwayne Ashley, Monica F. Azare, Joanne E. Hill, Andrea Hoffman, Sandra D. Jackson-Dumont, James Sullivan, Jocelyn Taylor, Ancy Verdier, and Lisa B. Walker. There were numerous luxury items auctioned off including dazzling bejeweled Christian Dior watches which Jocelyn Taylor modeled, a one of a kind pen created to commemorate Mathew Henson, the first African-American to reach the South Pole and a once-in-a lifetime chance to go behind the scenes with the famed Rockettes at Radio City Music Hall. 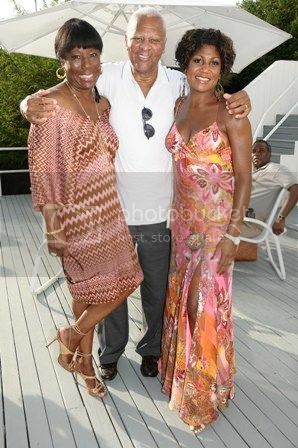 As well, many wonderful luxury items and once in a lifetime experiences are still available for bidding through September 2 on www.charitybuzz.com such as lunch with legendary Essence Magazine editor Susan L. Taylor and a private clarinet lesson from world renowned musician Anthony McGill, principal clarinetist with the Metropolitan Opera Orchestra. The highlight of the event was the performance by Ronald K. Brown who danced the powerful “For You” to Donny Hathaway’s popular tune “A Song for You” sung live by Gordon Chambers. The afternoon closed with the spirited and emotional “Walk Out the Dark” performed by four members of the company. At the end of the dance, Brown and the rest of the company joined the dancers on stage for an impromptu dance finale that incorporated the audience. In addition to public performances, Evidence sponsors outreach programs, workshops, master classes and educational activities for dance enthusiasts of all ages. 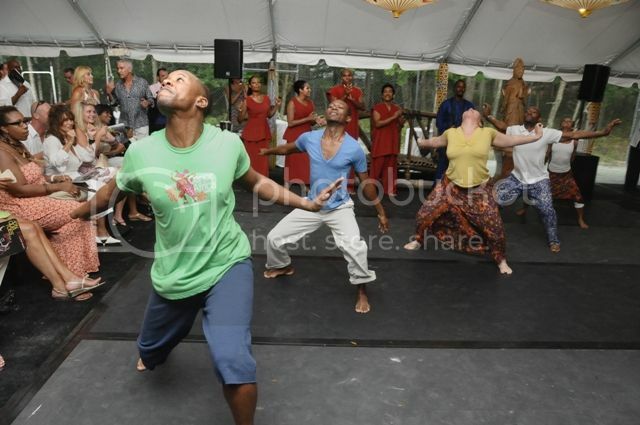 The Brooklyn-based nonprofit organization founded by Choreographer and Artistic Director Ronald K. Brown tours to some 30 communities around the world annually. It has also traveled overseas to Cuba, Brazil, England, France, Greece, Hungary, Mexico and Senegal to perform. For more information about Evidence and its 25th Anniversary activities visit www.evidencedance.com. Despite the current economic stress, Evidence received extraordinarily generous support for the event from sponsors HSBC Premier, 10 Cane Rum/Moet Hennessey, Prudential, Continental Airlines, Essence, Abyssinian Development Corporation and Uptown Magazine. Christian Dior provided gift bags, that included a Sean John cap and Carol's Daughter shea butter body lotion (I am now such a fan of this line). 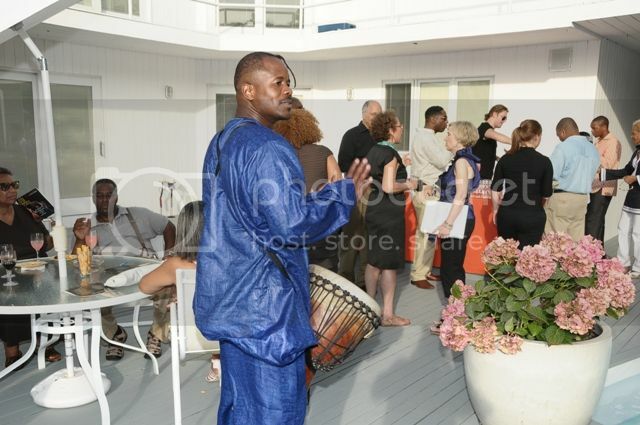 The media sponsor was Hamptons.com and the event was coordinated by The JFM Group. Following cocktails African drummers led the way through the dense woods to the massive party tent transformed into an island paradise by interior designer Anthony Bell and Deanna Annis of The Furniture Garden. Former CBS Early Show co-host Rene Syler emceed the afternoon’s proceedings with a comedic flair. The delightful Syler introduced the company’s new executive director Bruce Michael, who announced plans for the troupe’s upcoming 25th anniversary season in 2010, including a State Department sponsored tour of Africa, performances at the Vancouver International Dance Festival, a marvelous book chronicling the troupe’s 25 year journey, and a major gala in late winter. Wow! I didn't know you were an Ailey student, that's awesome! wow, what an awesome event! i would have loved to see them perform also!! more events like these need to happen in the future!!! it was a great time! i'm looking forward to next year!